Johns Hopkins Bloomberg School of Public Health researchers say they have discovered a new way that the most prevalent disease-causing fungus can thwart immune system attacks. The findings, published Sept. 7 in the Proceedings of the National Academy of Sciences, offer new clues about how Candida albicans, the fungus responsible for vaginal yeast infections and the mouth infection thrush, is able to cause a deadly infection once it enters the bloodstream. When the body is faced with an infection, cells give a burst of free radicals to kill the germs. C. albicans and other fungi use copper to fuel an enzyme designed to neutralize the free radical attack. But once the body senses the presence of the fungal infection, it flushes copper into the bloodstream to fight, leaving copper-starved fungus in the tissues in places like the kidney. But instead of being thwarted by a lack of copper to feed its defense, the Johns Hopkins team has discovered that C. albicans has uniquely evolved to switch from using copper to counter the free radicals to using the metal manganese. "What we have found here is a very clever adaptation to changes in copper during infection," says study leader Valeria C. Culotta, PhD, a professor in the Department of Biochemistry and Molecular Biology at the Bloomberg School. "The more we learn about this pathogen's ability to survive inside a human, the more points of vulnerability we may identify." 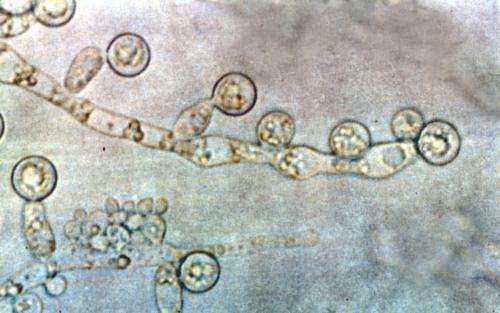 C. albicans only has the potential to become lethal to humans once it enters the bloodstream, where it can then affect the liver, spleen and kidneys. People with compromised immune systems such as premature babies, chemotherapy patients and those with HIV are particularly vulnerable to this and can die of the kidney failure it causes. Using a mouse model for C. albicans, Culotta and her team sought to understand why the pathogen switches between copper and manganese to fight free radicals. They discovered a surprising role for copper in immunity—levels of copper in the bloodstream go through the roof during infection in an attempt to kill the pathogen with copper poisoning. Organs such as the kidneys send their copper into the bloodstream, causing their levels to drop. The story would likely end there, if not for the switch the fungus makes in how it protects itself, one of the Johns Hopkins team's new discoveries. In an unexpected twist, the enzyme C. albicans uses to counter the free radicals changes from one that requires copper to one that requires manganese. The fungus can then use manganese to neutralize the attack. "The fungus laughs in the face of this loss in copper by simply switching metals," Culotta says. "Somehow this fungus has evolved to adapt to this immune system attack. This allows C. albicans to survive when other organisms might be thwarted." Copper and manganese are both found in relatively small quantities in the human body. Copper mainly comes from the consumption of crustaceans such as lobster and crab and from vegetables grown in copper-containing soil. Manganese is found in whole grains, nuts, leafy vegetables and teas. Copper is known to fight off the spread of bacteria. In the United Kingdom, for example, many hospitals have switched out steel doorknobs for copper ones. The pathogens can't live on the surface of the copper knobs, dramatically reducing the spread of infections. Current antifungal medications work on the surface of the cell to destroy the fungus. But there is a growing problem of human resistance to antifungal medications, similar to the well-known issue of antibiotic resistance. Just as has happened with some antibiotics, some fungi have evolved with the overuse of current antifungal medications and may no longer respond to the drugs designed to cure them. Culotta says there may be some way to design drugs in the future to disrupt the process whereby C. albicans switches from using a copper-based enzyme to a manganese-based one.